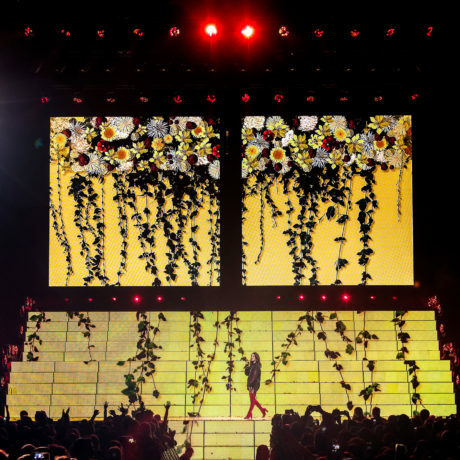 WORLD – Everyone is talking about Halsey and her “Hopeless Fountain Kingdom” world tour – apart from the critical acclaim – and commercial success – of her second album and several emanating singles, the reviews keep raving about the creativity, art and attitude of the highly visual young singer / activist’s live performances. So, it comes as no surprise to discover that Sooner Routhier and Robert Long of SRae Productions are behind the show’s production design – known for their imagination and uniquely lateral approach. With Ashley Frangipane (Halsey) herself the show’s creative director, and right at the essence of the presentation … the harmony and aesthetics are truly a special collaboration. 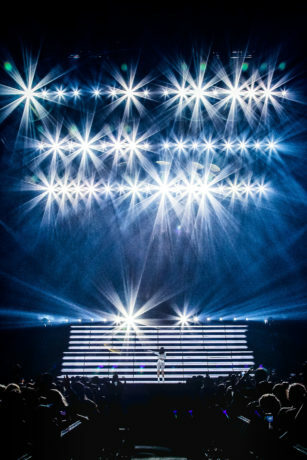 Fifty-four Robe Spiider LED wash beams, a brand-new investment by DCR Nashville, lighting vendors for the US legs of the tour, are a vital part of the lighting rig. The tour started in autumn 2017, and SRae submitted their initial proposals in May of last year. At the start, Halsey suggested a Romeo & Juliet-esque romantic look, so original versions of the set were based on this. However, once SRae began to also design promo and award show performances, an alternative approach evolved. Sooner and Robert both noticed how “incredible” Halsey is at negotiating stars during a show. They felt “she needed a unique performance space” … so the giant staircase set was born – an elegant and dynamic triple decker construction, with each level connected by smaller flights of stairs. Upstage of the top stair are two large LED screens. 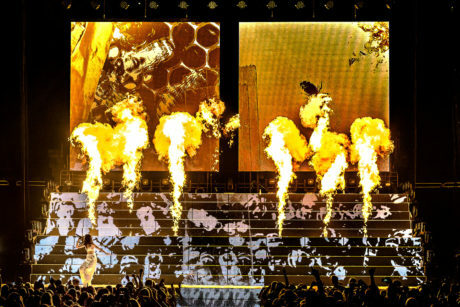 Serendipitously, it turned out that the artist’s own ideas of how the touring set should start developing from this point … were almost identical to their own thoughts! With her so involved in the creative process, “it was a really pleasant surprise to know we were all on the same page from the off” stated Sooner. 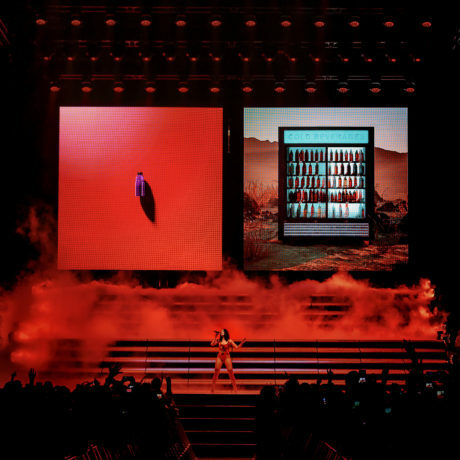 When it came to specifying lighting kit for the tour, lighting director on the road Craig Rutherford – who has worked with Halsey in this role since the latter stages of the 2015-16 ‘Badlands’ tour campaign to promote her ground-breaking debut studio album – suggested Spiiders as they are currently his favorite wash light! “I’m very much a “right tool for the job” type of person” stated Craig who likes the fact that Spiiders can fill a variety of roles. Twenty-four Spiider are positioned all over the overhead rig on three flown trusses staggered to mirror the shape and depth variations of the large steps on the set below. Four are positioned above the band with another eight behind them for effect. The balance are on the deck, lining the sides of the steps and stairways, where they can wash across the whole set and side light the artist as well as create some stunning overall pixel effects. The final eight Spiiders are within the B-stage structure at FOH. All the Spiiders are running in wide mode to enable an array of fluid kinetic pixel effects that are used to accent and highlight some of the intricacies in the music. As the primary wash light, they are constantly in action. The stair units are utilized for side lighting and effects from the lower cross stage angles, occasionally turning to beam out toward the audience for aerial effects. The ones in the overhead rig produce multiple looks throughout the show including rings, shapes and other effects, so they’re not always being used as a straight wash. The flower is used sparingly as a unique gobo look to really WOW the audience at strategic moments. “We play extensively with the pixel effects, and really maximize the visual variety that can be achieved” confirmed Craig. Craig has been using Robe products since their brand profile and presence started to rise in the US, thanks to the hard work of the team at subsidiary Robe North America, and he thinks the company is doing extremely well. He recalls an encounter at LDI a couple of years back where he was directed to a person on the Robe stand to answer some in-depth technical questions. That person turned out to be Josef Valchar, Robe’s CEO, “who answered all my questions and was extremely knowledgeable” explained Craig. Andre Petrus was SRae’s lighting programmer for the tour. He, Sooner and Robert hear and translate music into lighting in a very similar way explained Sooner, so there are an infinite number of musical details that have corresponding lighting cues and effects. “So much so, that all the lighting fixtures tend to look totally different from one song to the next” she observed. Andre and Craig also enjoyed a very good working relationship and constantly bounced ideas back and forth during the pre-production period. 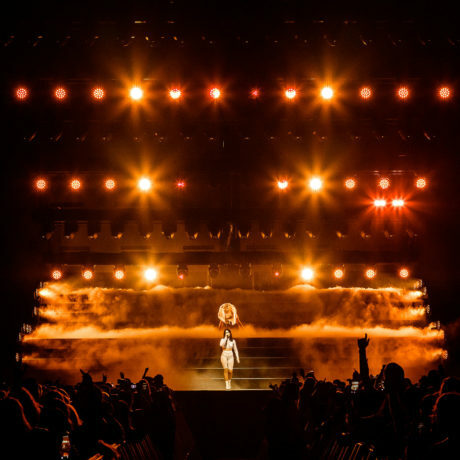 Technical production specialist DCR Nashville has been supplying lighting for the tour since April 2018 and are extremely happy with the decision made to buy the Spiiders says general manager John Schirmer. He has worked with Sooner – who is also based in Nashville – on several previous projects. He observed that the fixtures are also a very flexible choice generally for programmers and designers. DCR Nashville “Believes heavily in Robe as a brand” added John. They enjoy a very strong relationship with the sales team at Robe North America, although “Support has been almost non-existent – we’ve not needed it and that is a great thing! As GM not having to contact the manufacturer for support … is my favorite part!” he underlined. DCR Nashville also owns around 100 Robe Spikies which they started purchasing in 2016 for country music singer, songwriter and record producer Bradley Gilbert’s live performances.